Samara Private Game Reserve, Siroki Lodge, Solio Lodge, John Stevens Guided Safaris Africa, Kariega Game Reserve, Inyati Game Lodge, Ride Kenya, ol Donyo Lodge, Lewa Wildlife Conservancy and Karnali Lodge and Camp. Having had the amazing pleasure of watching these wonderful animals in their native habitat, I felt compelled to communicate with PfaP travelers how serious their plight is. When Sarah wrote asking if she could write a blog regarding rhinos, it was my honor to offer this platform. Just last night, one of our neighbours in South Africa had a rhino poached. Terror strikes in my heart every full moon, which is what it is at the moment. At full moon, when poachers are able to move through the veld, guided by natural moon light, is the time when our precious creatures and those who guard them are most at risk. Our trackers and rangers and reserve staff are all on high alert as we all are in game reserves and national parks across Africa. I would like to highlight this incredibly serious problem as somewhere in Africa today, every 15 minutes an elephant is slaughtered for its tusks which are then sold to potentially fund terrorism activities. And every 9 hours a rhino is poached for its horn, which is then sold largely to the Far East, predominantly China and Vietnam, to supposedly cure a list of ailments which range from fevers to hangovers. 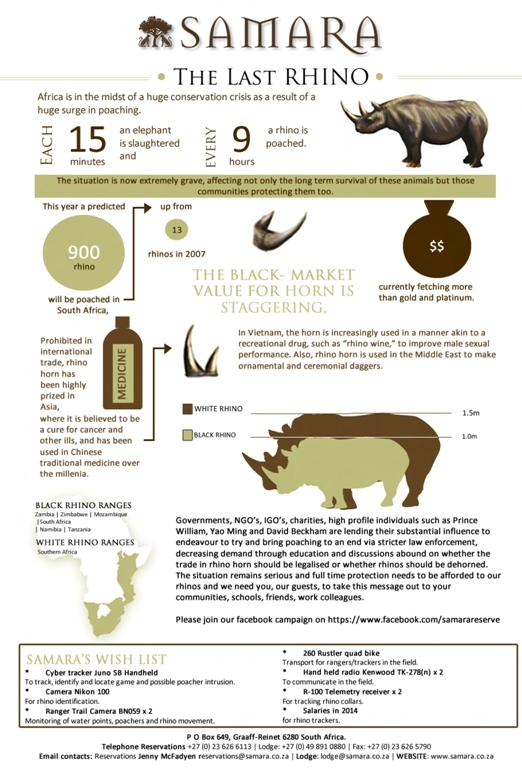 THE BLACK-MARKET VALUE FOR RHINO HORN IS STAGGERING, currently fetching more than gold and platinum. This year a predicted 900 rhino will be poached in South Africa, up from 13 rhinos in 2007. 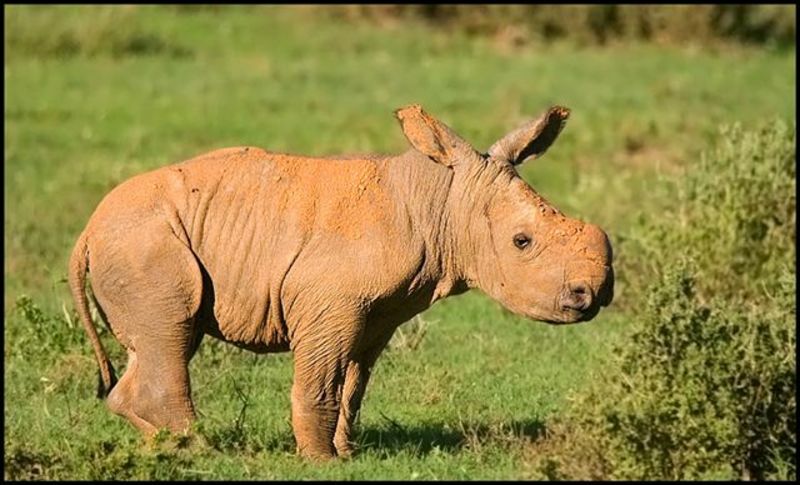 Rhino horn has been used in traditional Chinese medicine for centuries. It is composed largely of the protein keratin, also the chief component in hair, fingernails, and animal hooves and is used to try and cure a variety of ailments such as fever, rheumatism and gout. But today demand has gone through the roof, thanks to bizarre rumours about miraculous rhino horn cures. Today, it is supposedly used to treat everything from cancer to hangovers, whilst some take it purely to advertise their wealth. This growth in demand is occurring despite the fact that it is currently illegal to purchase rhino horn in China. In Vietnam, the horn is increasingly used in a manner akin to a recreational drug, such as “rhino wine,” to improve male sexual performance. Also, rhino horn is used in the Middle East to make ornamental and ceremonial daggers. .The situation is now extremely grave, affecting not only the long term survival of these animals but those communities protecting them too. Governments, NGO’s, IGO’s, charities, high profile individuals such as Prince William, Yao Ming and David Beckham are lending their substantial influence to endeavour to try and bring poaching to an end via stricter law enforcement, decreasing demand through education and discussions abound on whether the trade in rhino horn should be legalised or whether rhinos should be dehorned. The situation remains serious and full time protection needs to be afforded to our rhinos and we need you to take this message out to your communities, schools, friends, work colleagues.